Designed to address the space constraints of today's emergency vehicles, the SA-430M Patriot Mechanical control head is just 1″ in depth offering minimal intrusion into factory or custom made dashes or consoles. Combine this practical design with the distinctive “Big Engine” sound of the Mechanical tone and Carson replica “Stutter” Air Horn and you can truly Run Small and Sound Big! The features of this siren are easily selected at installation using an internal DIP switch. 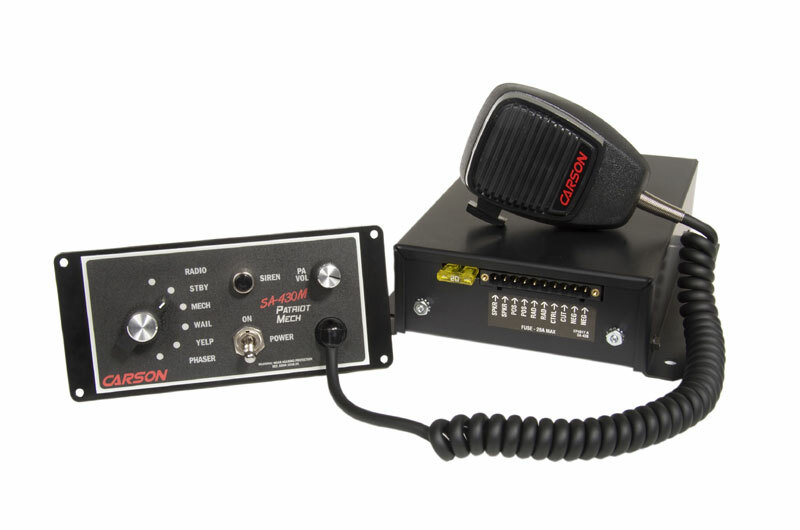 The SA-430M Patriot Mechanical siren is designed to power one or two 100-watt siren speakers and includes external fusing, short circuit, high voltage and reverse polarity protection systems. A detachable wiring connector and optional mounting bracket for the PA microphone are also included. As with all Carson Sirens products, the SA-430M Patriot Mechanical is backed by a no-hassle 5 year limited warranty.